After a so-so start to the southern Arizona summer “monsoon” season, storms pounded Tucson through early August with almost rhythmic frequency. It was much the same in the metropolitan Phoenix area, which saw an unusual spate of strong storms moving through Arizona’s south-central Valley on five out of six days beginning on August 7. This year’s summer storm activity has been widespread. Arizona’s eastern mountains saw almost daily rainfall from mid-July through early- to mid-August. To the north, meanwhile, the strong storms started in earnest early. 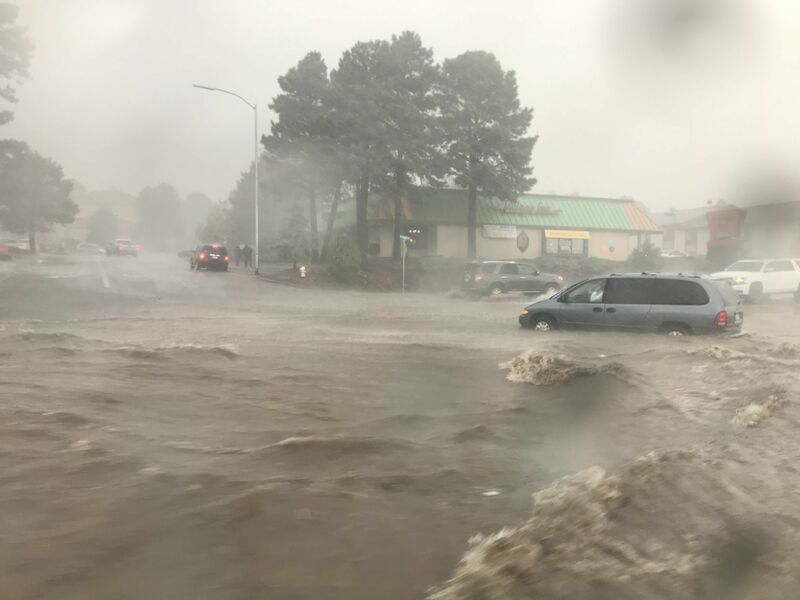 Persistent, heavy rain battered the Flagstaff region commencing in mid-July, generating flash floods and localized flooding in many Flagstaff-area neighborhoods. On July 18, a an estimated “1,000-year” storm dumped an astonishing six inches of rain on Flagstaff, with 4.5 inches of it pouring down in a span of just two hours. The summer storm season has been so strong at times, in fact, that it has prompted some to ask: Is this the strongest monsoon-storm season ever for Arizona? There’s no simple answer to that. Arizona takes its summer monsoon season seriously. There is an extended web of agencies, including the Arizona Department of Water Resources, that performs a vast array of services tied to storm activity. The National Weather Service, for example, monitors the conditions that may provoke Arizona storms. It reports both locally and from the service’s Climate Prediction Center (a function of the National Oceanic and Atmospheric Administration) in Maryland. A complex, multi-agency system in Arizona, meanwhile, uses sophisticated land- and satellite-based technology to track storm production, including rain levels and flooding, and gets that information out to the public as soon as possible. ADWR is the lead State agency for the Arizona Flood Warning System, or AFWS. The AFWS is comprised of local, state and federal entities that collaborate on statewide strategies for flood management. So, what is all that data telling us about the strength of the 2018 summer monsoon season thus far? It has set records in Flagstaff. But elsewhere? Paul Iñiguez, a meteorologist with the NWS in Phoenix, recently told the Arizona Republic that from the standpoint of rainfall, the summer monsoons have been very productive in central Arizona, too. 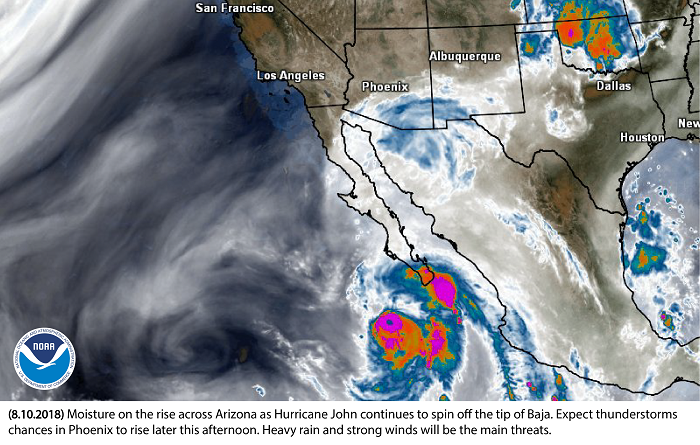 Jon Gottschalck, chief of the Operational Prediction Branch at the Climate Prediction Center with the National Oceanic and Atmospheric Administration, told KJZZ recently about how “tropical cyclones” in the eastern Pacific basin are connected to Arizona’s monsoon storms. Hurricanes, typhoons and other major Pacific storms all come under the general heading of tropical cyclones. He said a spate of tropical cyclones in the eastern Pacific likely contributed to the moisture surges in Arizona and New Mexico that, among other things, produced the amazing string of consecutive stormy days in central Arizona. Big Pacific storms, he said, do not have to make direct hits on the Southwest to have an impact. PHOENIX- The Arizona Water Protection Fund (AWPF) supports projects that develop or implement on the ground measures that directly maintain, enhance and restore Arizona’s river and riparian resources. The AWPF Commission is now accepting applications for the Fiscal Year (FY) 2019 AWPF grant cycle. The deadline to submit applications is September 7, 2018 at 3:00pm. The AWPF Commission awards grants under three categories: capital projects, research and water conservation. The grant cycle schedule, grant application manual, and electronic forms are available on the AWPF website at: www.azwpf.gov . *Staff will also be hosting a live online webinar of the grant application workshop for those not able to attend in person. Please contact the Arizona Water Protection Fund (602-771-8528) for more information prior to August 10, 2018. The AWPF promotes the use of incentives emphasizing local implementation rather than regulation to address resource concerns. As such, the AWPF Commission’s philosophy has been to utilize a grassroots approach to improving river and riparian resources statewide. The Arizona Legislature established the AWPF in 1994 (A.R.S. § 45-2101, et seq.). The Arizona Department of Water Resources provides administrative, technical, and legal support to the AWPF Commission. The legislation establishing the AWPF provides that it is the declared policy of the Legislature to provide for a coordinated effort between state funding and locally led solutions for the restoration and conservation of the water resources of the state. A.R.S. § 45-2101(A). The primary purpose of the AWPF is to provide monies through a competitive public grant process for implementation of measures to protect water of sufficient quality and quantity to maintain, enhance, and restore rivers and streams and associated riparian resources consistent with existing water law and water rights, and measures to increase water availability. A.R.S. § 45-2101(B). For additional information, please contact Reuben Teran at rteran@azwater.gov. Among its many duties focused on the protection and health of Arizona’s forestlands, the Forestry Department provides public outreach through various platforms including social media, billboard marketing campaigns, public service announcements, and community-wide events – all of it focused on informing Arizonans about the condition of their forests and the need to protect this valuable resource.As Arizona warily approaches an early summer fire season marked by record-low watershed runoff and tinder-dry forests, the Arizona Department of Forestry and Fire Management is gearing up for what many fear may be a challenging time ahead. Much of that work falls to Tiffany Davila, a public information officer for Forestry and Fire Management. Tiffany has long been a familiar face among Arizona media covering wildfires in Arizona, providing up-to-date information on many of the more serious conflagrations that plague the state at this time of year. Arizona Water News recently caught up with Tiffany to get her sense of what lies ahead for Arizona’s forests. 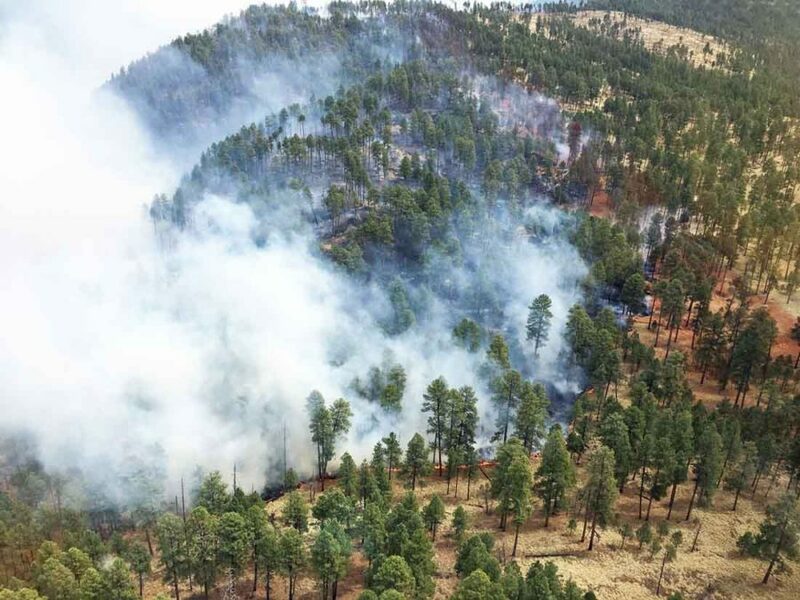 Arizona Water News: With the human-caused Rattlesnake Fire southwest of Alpine, the state’s wildfire ‘season’ already seems to be underway. Are we seeing an unusually early start this year for forest fires? Tiffany Davila: Unfortunately, there doesn’t seem to be a ‘season’ anymore. Wildfire activity picks up every month nowadays. This January and February we had fire activity across southern Arizona and we expect it to get even busier across the entire State as we move into the warmer months. Last year, the Sawmill Fire started on April 23rd and burned nearly 47,000 acres. This year, the Rattlesnake Fire started even earlier and has already reached 22,000 acres. Southern Arizona was very active last year. But this year is different. The lack of precipitation over the winter and increasingly warm temperatures means a decrease in fuel moisture. Therefore, the fire outlook predicted is for high wildfire activity across all of Arizona. AWN: Rangers in the Tonto National Forest reported issuing 300 warnings and citations between April 20 and 22 for violations of Stage II fire restrictions in the forest – violations that include use of wood and charcoal in campfires, smoking outdoors, parking on dry vegetation. Is it tough getting out the message that these are extremely dangerous things to do in the forest at this time of year? TD: It’s very hard and at times I feel like a broken record repeating the same things: ‘Don’t drag tow chains… put out your campfires completely… create defensible space… don’t burn on windy days…’ I think I even say it in my sleep. But seriously, if we keep reinforcing and pushing the messaging it will eventually stick with folks. 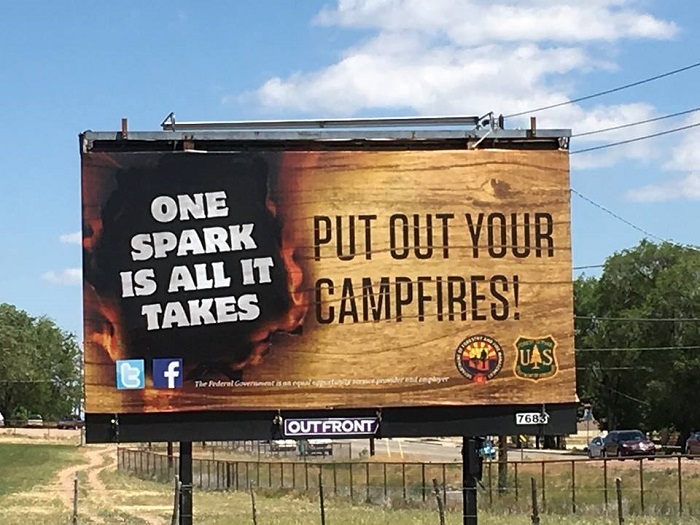 Many times, people become complacent and yes, accidents do happen, but one spark is really all it takes to start a major wildfire and that’s why it’s very important we continue our marketing efforts to push out our prevention messaging year-round. AWN: On the plus side, cooler weather and lighter winds for several days have appeared to have helped firefighters with the Rattlesnake Fire. On the minus side, forecasters anticipate dry lightning moving into Arizona during the coming weekend. Is it fair to say you have a love-hate relationship with the weather service at this time of the year? TD: Actually, we have a love-hate relationship with mother nature. Ha! The forecasters are just doing their jobs. We are fortunate that all our forecasters excel at what they do. The weather service is very good at keeping us briefed on incoming or poor weather conditions during a fire. In a critical fire situation, we can call them for a spot weather report and they will immediately get us the data we need. Spot weather forecasts are very important because they are based off a pinpointed location of a fire and can be customized to that area. The forecasters help us do our jobs more effectively and safely and we thank them for that. AWN: Governor Ducey recently announced doubling his request for fire prevention funding this year to $2 million. How does that funding get used? TD: That funding is specific for the Department of Forestry and Fire Management’s Hazardous Vegetation Removal program. We use that funding to conduct mitigation projects across the state. We have several ongoing projects, including one in Safford that is targeting the salt cedar along the Gila River Corridor. Salt cedar, or tamarisk, is a highly flammable and invasive plant that can cause a fire to spread fast and burn very hot. Since last fall, DFFM crews have been working to remove the salt cedar and treat it with herbicide to prevent it from growing back. Another project that was part of our HVR funding was the fuel break project near Mayer. The 270-acre fuel break installation was a multi-year project that essentially created a buffer zone for the town of Mayer. The break was tested after last year’s Goodwin Fire and proved successful in stopping the fire from moving into the town. HVR funding is essential for our work, and having that additional money, should the Legislature approve, will be critical in allowing us to do more projects in high-risk areas around our state. AWN: The communications team at Forestry and Fire Management notoriously gets zero rest when a major fire breaks out. Can you tell us what you do to keep Arizonans aware of things during a fire incident? TD: We just drink a lot of coffee and energy drinks. I think last year, I worked more than 100 hours during the first seven days the Sawmill Fire started. I’m not even sure how that’s possible. We have multiple ways to get information out to the public, and one of them is using InciWeb, a public website. There, the public can find evacuation or road closure notices, fire size and containment numbers, pictures, maps, and other information they may be looking for or needing. We also work closely with our county emergency managers, the sheriff departments, the Arizona Department of Transportation, the Red Cross and, of course, our partnering agencies — the Bureau of Land Management and the Forest Service — to make sure we are getting the public the pertinent information they need in a timely manner. Often, we conduct public meetings or town halls to ensure we are reaching all the residents impacted by a fire. We also use ‘trap lines,’ which are basically informational booths, that we set up throughout impacted communities, like at a convenience store or post office, where residents can get information on fire size, suppression efforts, and assistance services, like the Red Cross. And we can’t forget about social media! The Arizona Department of Forestry and Fire Management uses social media to update the public once a fire breaks out and throughout its duration. Every fire is different, so each requires a different approach from a public information standpoint. In the end, our goal is to make sure our residents are safe, and they are getting the information they need to keep them briefed and try to make them at ease during tense situations. AWN: Your Twitter handle is “asusundevils2000.” Just how big a Sun Devils fan are you? TD: Let’s just say I bleed maroon and gold. I’m a huge Sun Devil fan! How can I not be? I’m a native Arizonan! I graduated from Arizona State University’s Walter Cronkite School of Journalism and Mass Communication and I am a football season ticket holder! My grandparents were season ticket holders for decades and used to take my brother and I to football games and it just became a family tradition. Our whole family supports ASU, not only the football program, but the institution itself! Forks up! Go Devils! Under the direction of master-of-ceremonies Tom Buschatzke, the Arizona delegation conducted its necessary business work and house-keeping duties related to the Colorado River Water Users Association during the organization’s meetings last week. The big news coming out of the Thursday breakfast meeting was that the so-called “big four” Arizona water organizations, which rotate Arizona presence on the Board of Trustees, rotated. Three of the four (the Arizona Department of Water Resources, Salt River Project, Yuma Area water users and the Central Arizona Water Conservation District) were in. One was out. The odd group out this year? The CAWCD. The rotation scheme was set up years ago, noted Wade Noble, a representative of Yuma agriculture. Buschatzke, Dave Roberts of SRP and Elston Grubaugh of the Wellton-Mohawk Irrigation & Drainage District will take on trustee duties. Water Resources Director Buschatzke updated the Arizona attendees on 2017 state-related water issues. Buschatzke briefed attendees on the status of Minute 323, the important water agreement completed this year between the U.S. and Mexico. A big part of the agreement involves progress on desalination efforts, he said. This isn’t confirmed, but Yuma-area ag representative Wade Noble told the substantial Arizona delegation to CRWUA that there is a reason why Arizona attendees must walk farther than anyone else when going to their caucus breakfast meetings. It’s because Arizona is the largest of all the CRWUA contingents and their breakfast meeting room was the only one capable of holding such a large group. Ducey chief of staff Kirk Adams attended the Colorado River Water Users Association meetings this week in Las Vegas. Adams told the attendees with whom he met that Governor Ducey is committed to prioritizing a plan that will provide Arizona with a sustainable water future. “We’re moving full-steam ahead with a broad coalition of stakeholders,” Adams said. Adams addressed a theme that has become a central focus of the annual three-day CRWUA this year: pushing the long-debated Drought Contingency Plan agreement among Colorado River water users across the finish line. At a keynote panel discussion involving top water executives organized the next day, all five panelists — including Arizona Water Resources Department Director Tom Buschatzke — emphasized the urgency of completing the multi-state agreement to protect Lake Mead. “Not to be overly dramatic, but I believe that DCP is fundamental to the survival of how we do business,” said John Entsminger, general manager of the Southern Nevada Water Authority. Arizona Water Resources Director Buschatzke returned to the DCP theme during nearly all of his speaking engagements at the conference. “I’ve said it before, we need all hands on deck” to complete Lake Mead-saving water agreements, including both those hands inside Arizona and outside the state. Chief of Staff Adams met on Wednesday with members. Arizona Department of Water Resources Director Tom Buschatzke on Wednesday told a panel of U.S. senators that an agreement to settle a tribal water-rights claim in northwestern Arizona constitutes a rare resolution that creates positive outcomes for all involved. In both written and oral testimony, Buschatzke expressed Arizona’s strong support of S. 1770 – the Hualapai Tribe Water Rights Settlement Act of 2017, sponsored by Sens. Jeff Flake and John McCain – to the Senate Committee on Indian Affairs. He told the panel that the State of Arizona is strongly supportive of S. 1770, which formalizes an agreement reached in 2016 between the Tribe, the State of Arizona and several other major Arizona water users. The United States participated in the negotiations through a team appointed by the Secretary of the Interior. The agreement provides 4,000 acre-feet of Colorado River water annually to the Hualapai Tribe. As sponsor, Sen. Flake welcomed Director Buschatzke to the hearing. In written testimony, Buschatzke told the senators that it represents a major step forward in providing water-certainty to all water users throughout Arizona. “Half of the 22 federally recognized Indian tribes in Arizona still have unresolved water rights claims,” wrote Buschatzke. “Resolving these claims through settlement is a strategic priority for the State, not only because it will avoid the cost and uncertainty of litigating the claims, but it will provide certainty to all water users in the state regarding available water supplies in the most expeditious manner possible,” he said. The United States also will benefit from the reduced risk of costs associated with litigating the Tribe’s water-rights claims, Buschatzke noted. The Tribe operates the famous “Skywalk” tourist attraction at the western edge of the canyon, which attracts an estimated one million visitors annually. The Tribe has announced plans to expand that attraction. By providing the Tribe with a renewable source of water from the Colorado River, the agreement is consistent with State policy of conserving groundwater supplies for times of drought, the Director wrote. “Because the aquifer beneath the Tribe’s reservation extends to areas off the reservation, the Tribe’s use of a renewable water supply will help preserve groundwater supplies not just for the Tribe, but for non-tribal water users in the region,” said Buschatzke. In his written testimony, the Water Resources Director broke down the financial responsibilities that each of the parties agreed to shoulder in 2016. Those investments included a congressional appropriation of $134.5 million to build a pipeline to deliver the Colorado River water to Peach Springs and to the Tribe’s Grand Canyon West development. In addition, S. 1770 would authorize annual operation, maintenance and replacement costs of $32 million, as well as other federal expenditures. Non-federal contributions to the agreement “are significant,” said Buschatzke. The State of Arizona agreed to “firm” 557.5 acre-feet of the 4,000 acre-foot annual allocation to the Tribe, at a cost of $3.2 million to Arizona. “The financial benefits that the United States will receive through the settlement will greatly exceed the costs that the United States will incur in constructing a pipeline to bring water from the Colorado River to the Tribe’s reservation,” Buschatzke wrote to the Senate panel.